This is my tasty serving….on auto-publish while I make my way back from what should be a great weekend in Copenhagen – my first visit ever to a Nordic country! I made this video a few weeks ago, when I was in London for the FBC 2009. 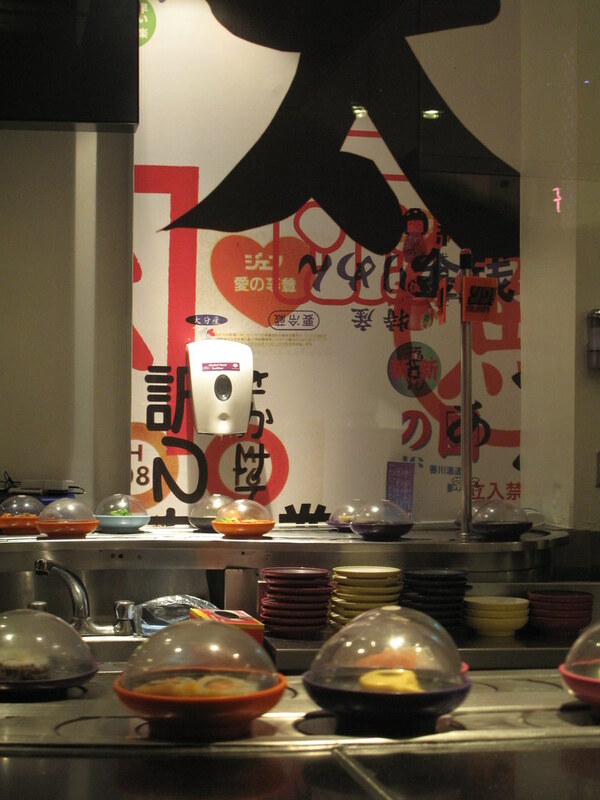 Walking in to the Selfridges Foodhall, I was confronted with the sight of converyor belts of sushi….and sashimi at Yo Sushi. I had ‘read’ about this phenomenon but never seen it live, so here it goes. So how do you Yo? First, you sit down, bottom and all perched on a bar stool. Then you get given a menu so you know what is what. 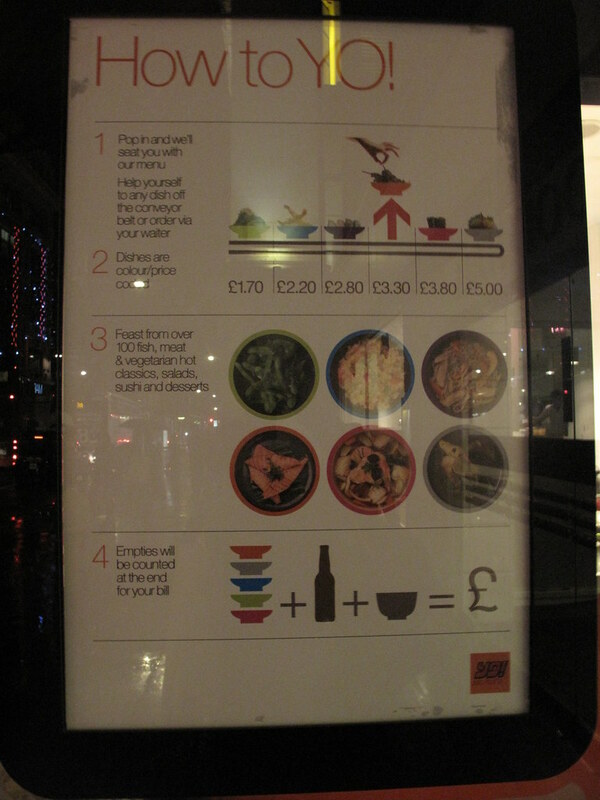 All this time, colourful bowls (colour-coded by price) are slowly making their way past you on the conveyor belt. And yes, you can reach out and touch….one of the bowls. Sushi, sashimi…all waiting to be had. Salads….and even desserts – you entire meal, circling before your eyes. 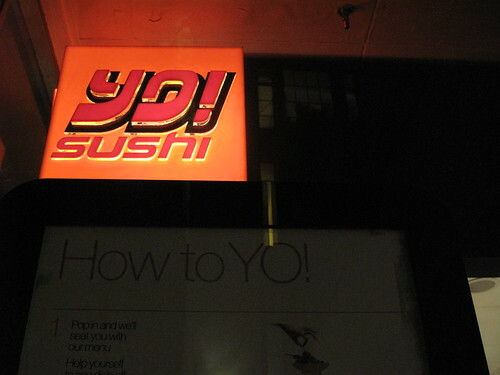 I love it, especially the knowledge that you don’t have to rush at the ‘Yo’ bar. You determine how fast…or slow your meal goes. Isn’t that cool for us, slow eaters? No hovering waiters or fast diners – we can eat what we want, when we want. Reason to celebrate! Drinks are available and there’s usually an atmosphere of energy and life, at the ‘Yo’ table! It is also nice to peek into the kitchen and watch the chefs cook….knowing that a lot of what sits before you is fresh. I’m sure bespoke orders are taken as well but since I didn’t try it, I can only speculate! When you’ve stuffed your face, consciously so, your empty bowls and bottles are counted and added up, and the bill is paid.